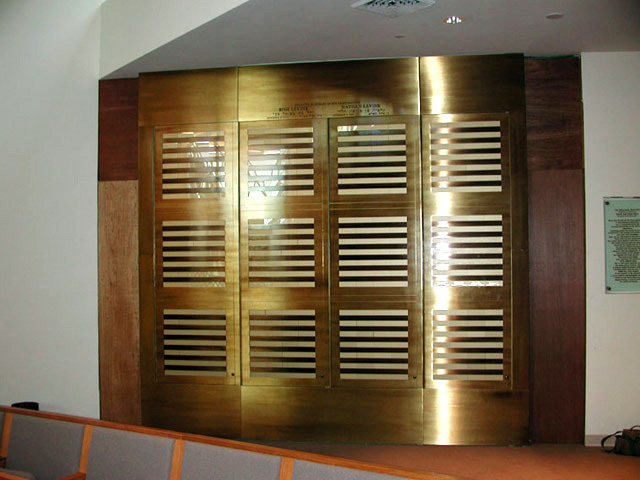 Massive oxidized brass doors accommodate backlit gold acrylic nameplates. 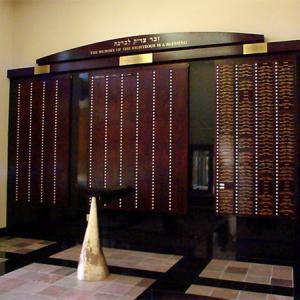 A custom damper system behind the doors keeps the plates dark until the Yahrzeit period. The doors open to reveal the florescent lighting system. 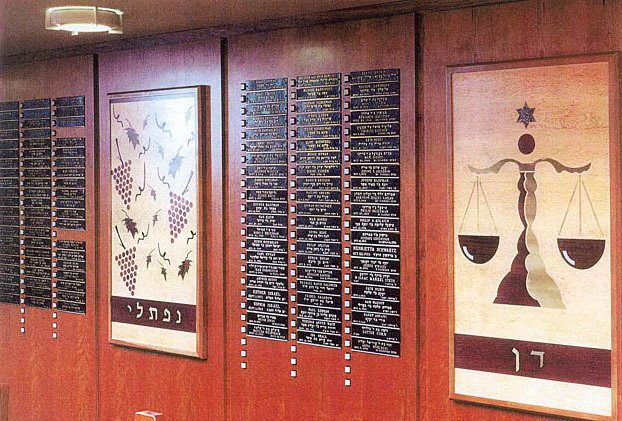 Cast bronze nameplates are affixed to satin brass bars mounted to custom wood backings. 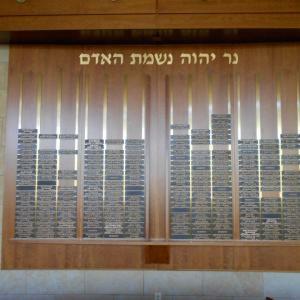 Individual satin brass cut letters title the wall. 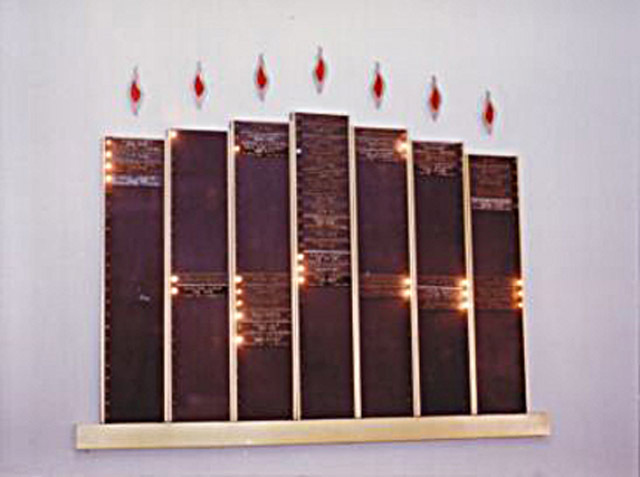 Pushbutton sockets are set into panels which form the walls of the sanctuary. They are pre-drilled to accommodate bronze nameplates. 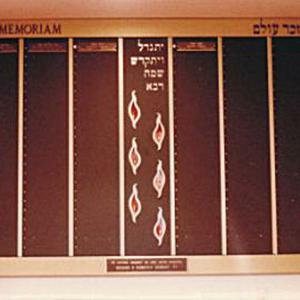 Custom wood inlays are dispersed between the memorial panels. 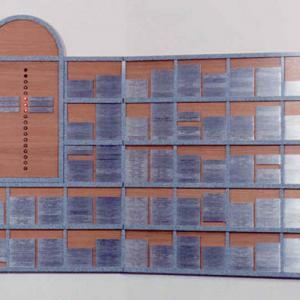 Satin aluminum engraved nameplates are magnetically set onto a laminated wood background. 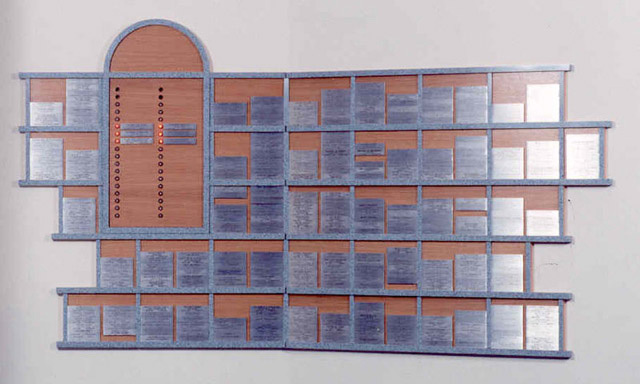 Corian divider bars are used to create the grid design. 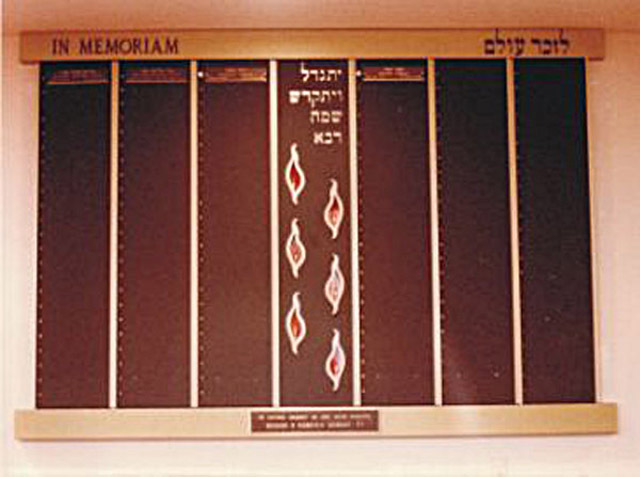 Plates are moved to the light box during the Yahrzeit period. 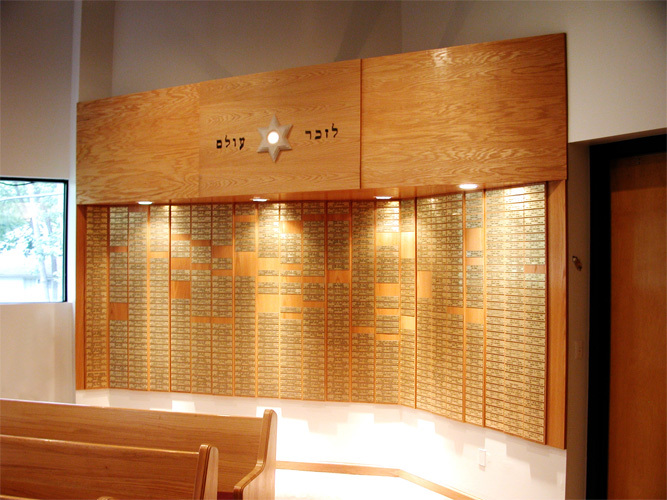 Satin brass nameplates mounted on custom oak columns. 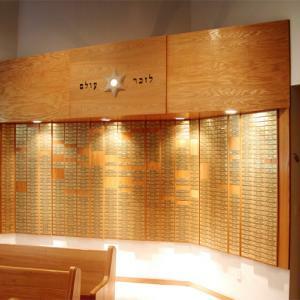 Illuminated acrylic Star of David and Hebrew Text title this unique memorial wall. 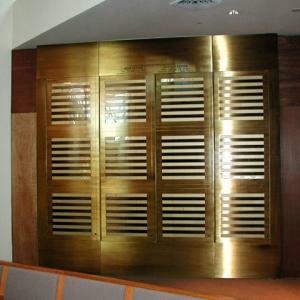 Metal Memorial Columns with raised brass divider bars form this unique Memorial Wall. 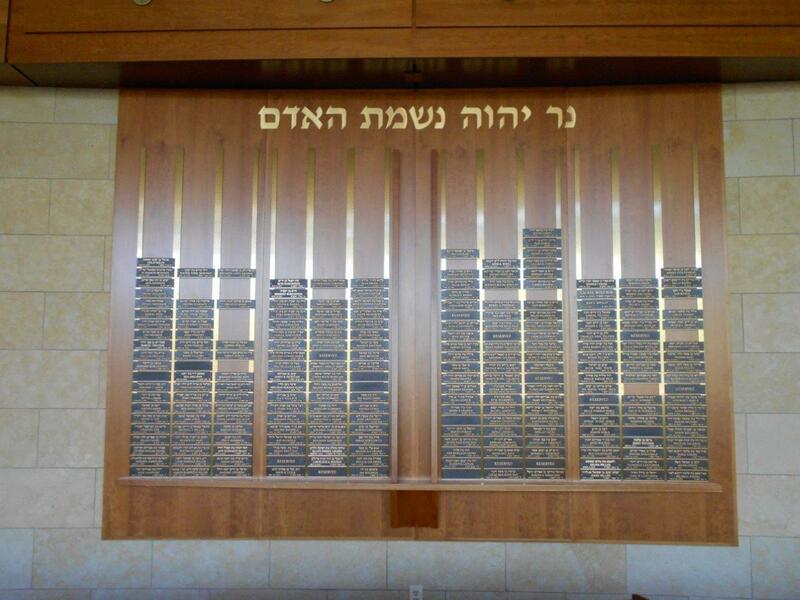 Individual cut letters and a cast bronze dedication plate are mounted on the horizontal frames. 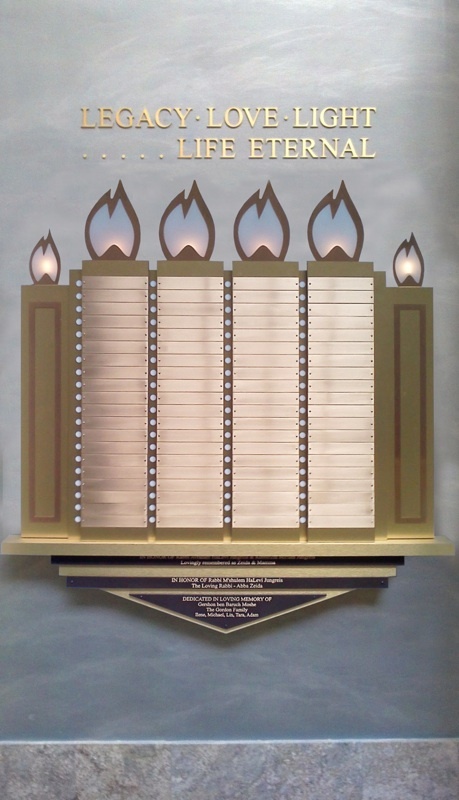 Metal or wood columns are designed to form a modern seven-arm Memorial Menorah. 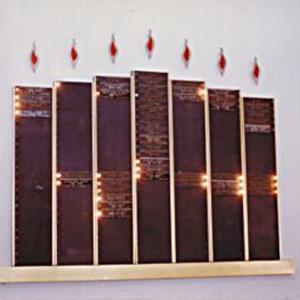 Non-illuminated flames are mounted to the wall above the columns. 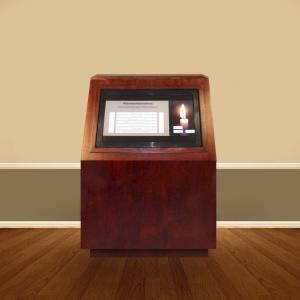 3 - Automated memorial Columns 39 x 22 x 1 oak veneer columns Each column accommodates 28 - 2” x 9” x 3/8” Plexiglas nameplates in 2 columns of 14. 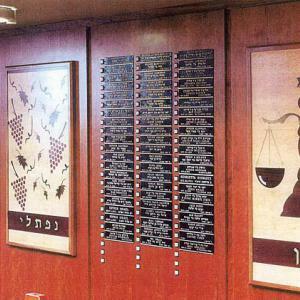 A patented automated LED light is to the left of each name behind 1” oak bar. 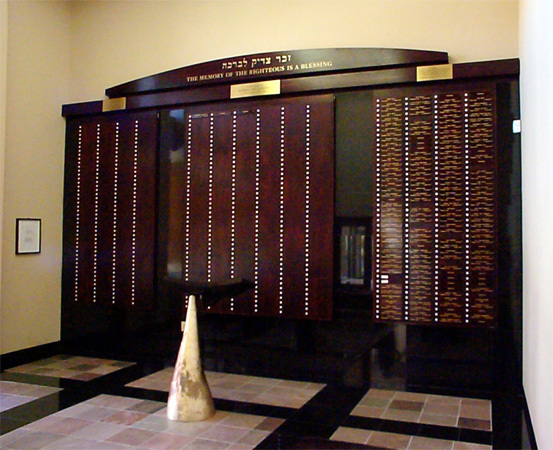 Mahogany wood panels, with round push button switches, accommodate bronze nameplates. 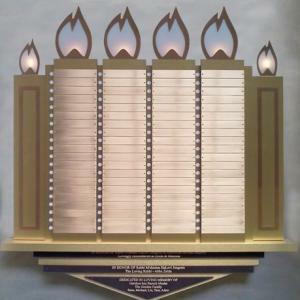 The top crown has 3 brass dedication plates and individual satin brass lettering. 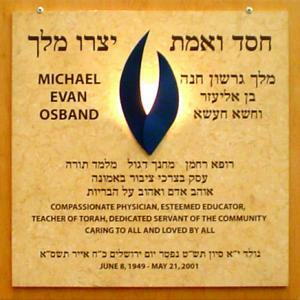 40" x 40" Jerusalem gold with sandblasted copy and custom fabricated illuminated metal flame is mounted to a maple background. 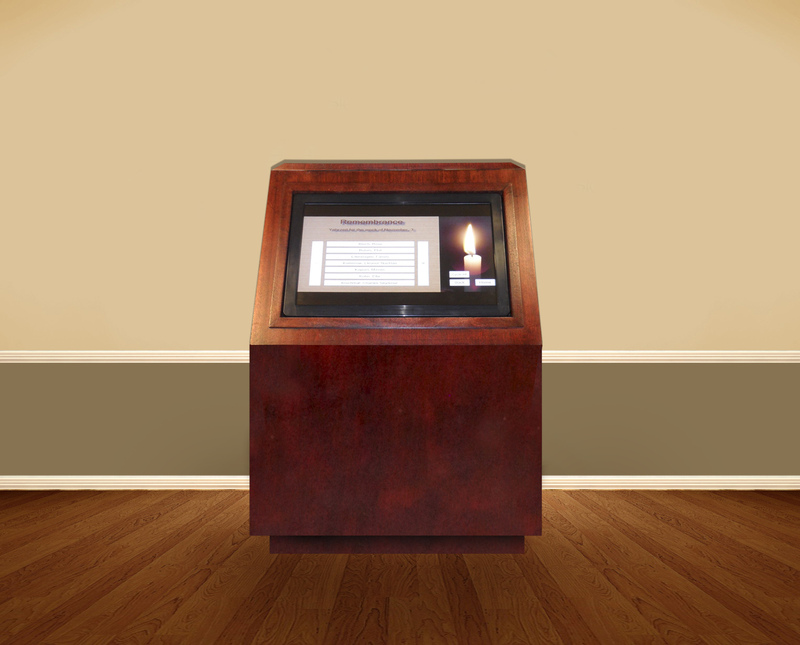 Flames and outside frames are satin bronze with blank satin bronze nameplates mounted next to the columns of automated lights. The nameplates with text will be dark bronze with raised gold text as in the bottom dedication triangle. Accent horizontal strips are cast bronze, plain edge. 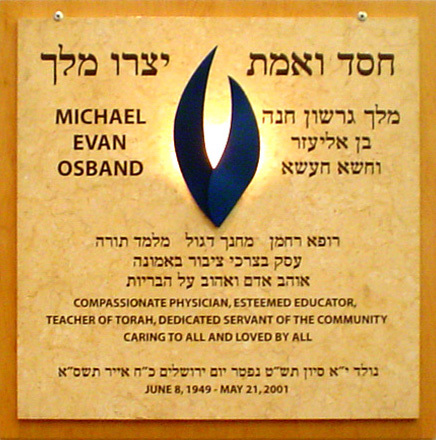 Individual satin brass letters title the design.